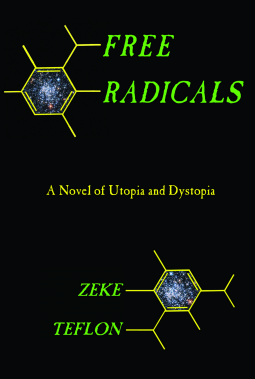 Set in a dystopian society in the not-too-distant future, this darkly humorous sci-fi novel follows the misadventures of a bar musician and army vet who's set up on terrorism charges and deported to a single-continent prison planet. After a fight in which he nearly kills a neo-Nazi, he flees to the other end of the continent with a prisoner he knew from Earth—a Mexican anarchist and fellow musician—on a Gulliver's Travels–type journey through a number of political and religious cult compounds. With comical and acidic depictions of the various cults they encounter on the way, Free Radicals insightfully explores the often-failed attempts at utopia and the day-to-day lives of two traveling musicians.